Miles of pristine beaches, dense forests, luxurious resorts, shopping, and nightlife are waiting for you in the Bahamas. Whether you’re looking for a beach to lie on, a party to go to, or an adventurous new water sport to try, the Bahamas has something for you to do. The earliest known inhabitants of the Bahamas are the Taino people, who came over from Hispaniola and Cuba and are now referred to as the Lucayans. Christopher Columbus first contact in the West Indies was in the Bahamas and although he did not colonize the area, the Spanish eventually wiped out the Lucayans (there are still Taino populations on other Caribbean islands, however). During the eighteenth century, the Bahamas were a popular port for pirates and legends abound. Today, the two major ethnic groups in the Bahamas are Afro-Bahamians and European Bahamians. The Afro-Bahamians make up eighty-five percent of the population of the Bahamas and the culture is heavily African influenced. The Bahamas are the Caribbean destination for travelers looking for a tropical getaway that’s easy to plan, easily accessible, and safe. The Bahamas are located just 45 miles from the Florida coast with many flights daily from the US. American and Bahamian relations have typically been close and positive in part due to the close proximity of the Bahamas to the US making the Bahamas a very safe place for Americans to travel. If you’re looking to be taken care of, the Bahamas are the perfect location for your next trip. The destination is extremely popular with tourists and the Bahamians know just how to cater to all of your needs. All-inclusive resorts are abundant and some are even specially designed for certain travel groups including families and seniors. 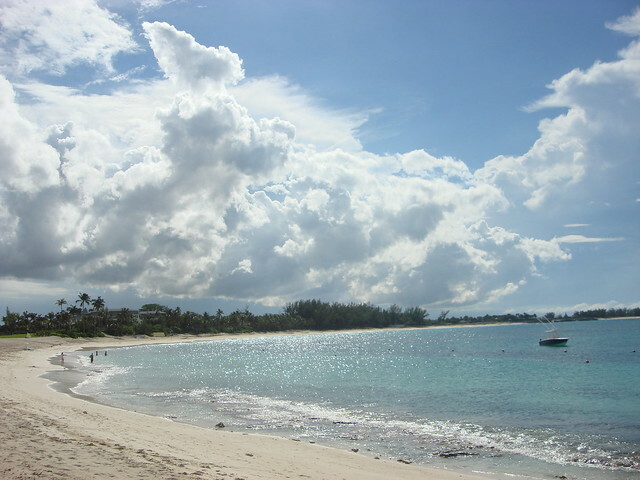 Beaches are the main attraction for most that travel to the Bahamas. Many of the beaches are lined with resorts, extensive shopping, and many restaurants and bars. Looking for an exotic, but not too exotic, beach to lie on while sipping fruity drinks with brightly colored umbrellas? The Bahamas is your perfect match. Beaches are a natural wonder of the Bahamas and their most talked about feature. Cruises, small boat tours, diving excursions, and snorkeling are all based around the beaches. While many may choose to just lounge on the beaches for their entire trip, those that wish for something more active will not be disappointed. SCUBA diving is popular off the coast of the Bahamas. The barrier reef off the island of Andros is a vast diving site where you can explore blue holes, mysterious pools that are the aftermath of collapsed underwater caves. The area off New Providence Island near Nassau is particularly known for shipwrecks. Anglers find the Bahamas a delight. The shallow waters between the islands are quite fertile and support fish in abundance. Some species you’ll find here are wahoo, grouper, and bonefish.